Earnest "Big Ern" Stewart (born 28 March 1969 in Veghel, Netherlands) is a Dutch-American soccer player who was a regular midfielder for the U.S. national team from 1990s until his retirement in 2005. Stewart, the son of African American USAF enlisted serviceman Earnie Stewart and his Dutch wife Annemien Stewart, grew up in the Netherlands, and began his professional career in that country in 1988 with VVV. He spent two years at the Dutch First Division (second-level) club before moving to Eredivisie side Willem II in 1990. 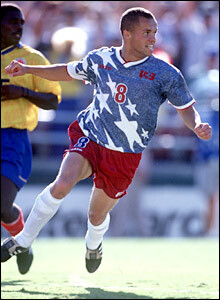 By the end of 1990, he made his first appearance for the U.S. national team against Portugal. In his first season at Willem II, he finished third on the goal-scoring list for the Dutch First Division, with 17. He went on to score 49 goals in six seasons there. In the meantime, he developed into a regular for the U.S. national team, starting all four games that the U.S. played in the 1994 FIFA World Cup. Most notably, he scored the goal that gave the U.S. its winning margin against Colombia in group play, the first World Cup game won by the U.S. since 1950. That game, sadly, would be more remembered for the own goal scored by Colombian defender Andrés Escobar, which led to Escobar's murder shortly after his return to Colombia. That goal was caused by an attempt to deflect a John Harkes shot away from Stewart, his intended target. By 1996, Stewart had moved to NAC Breda, eventually spending more than six seasons at NAC. The club was relegated in 1999, but Stewart helped the club win the First Division in 2000, thereby earning promotion back to the Eredivisie. During his years at NAC, he also played in all of the U.S. team's matches at the 1998 and 2002 FIFA World Cups, becoming one of only five U.S. men to play in three World Cups. In January 2003, he left the Netherlands to play in Major League Soccer, and was allocated to D.C. United, where he won the MLS Cup in his second season. His scoring numbers did not equal his earlier high standards, as he tallied just four regular season goals and one playoff goal in MLS. He left DC after the 2004 season, coming back to the Netherlands and his original club, VVV-Venlo, where he became technical director following his retirement in 2005. Stewart became the eighth U.S. man to make his 100th international appearance in a 2004 World Cup qualifier against Grenada. His 111 goals as a professional in the Netherlands makes him the highest-scoring American in international club play. He was named U.S. Soccer Athlete of the Year in 2001. He was named technical director of NAC Breda of the Dutch Eredivisie on May 14, 2006. Earnest Stewart was appointed as AZ’s new Director of Football in June 2010. The 41-year-old American succeeds Marcel Brands, who has left AZ for PSV. Stewart leaves his post as Technical Director at NAC Breda by mutual consent.